On one side, we have the PM exuding power and on the other the social activist reiterating her commitment to the struggle. Often as one reads news one senses different events juxtapose themselves together. It is not planned. There is no sense of paradox or irony, just two reports placed next to each other add to the poignancy of the Indian situation. The first event was presented like a report; it appeared like a postcard, a panoramic picture of Narendra Modi inaugurating the Narmada dam. The photograph is impressive and the occasion becomes a double mnemonic as one realises that the day of the inauguration is the day when PM Modi also celebrated his 67th birthday. As he performs the ritual one senses politicians do not need to cut cakes when they can dedicate a dam to the nation. The postcard has a finality to it, a fait accompli conveying that the battle against the dam is dead. The inauguration was an attempt to write off resistance, create the monumentality of the dam to erase the memory of protest. As Modi stands to face the water, one senses history being made. Next to this report was a letter from Medha Patkar thanking friends for the support they gave during the mass actions against the dam. As one juxtaposes the postcard and the letter, one almost gets a sense of a dualistic world. On one side, we have Modi and the nation-state exuding power and finality and on the other Medha Patkar reiterating her commitment to the struggle. The contrast of style, the semiotics of bodies, the content of messages is starkly different. Yet each act of communication speaks starkly for itself. The newspapers of the week itemise timewise the various acts and sayings of the PM. He refers to the various saints who have started campaigns for river conservation. The direct reference possibly is to Jagadguru Vasudevacharya’s plan for cleaning up the rivers. Modi’s message is clear when saints and sadhus are backing him who is Medha Patkar to challenge him. Not content to invoke saints, Modi also invokes Sardar Patel, an icon of the Indian nation-state. He promises that the Sardar’s statue would be memorable. He modestly states “I neither think small nor think of small projects. The Sardar statue of National Unity will be twice the height of the Statue of Liberty.” As an ode to monumentality, the statement is unbeatable. Behind every promise is a threat. He warns he has a list of all those who objected to the dam. Modi’s postcard of definitive pronouncements announces the closure of the struggle. Medha replies that the dam is not complete nor is the debate. A dam, Medha reminds us, is not tons of concrete but a promissory note to the people offering rehabilitation, environmental guarantees and a promise of archeological preservation. The dam wants to erase from memory the narratives of suffering by offering a tribal museum. Medha asks how can erasure and irresponsibility be a gift to the nation. The contrast in arguments is stunning. One talks of national unity by suppressing dissent. The other appeals to the idea of democracy and constitutionality to say that Narmada violates the law and the spirit of the nation. Modi invokes two people who might be embarrassed to be cited in this context — Ambedkar and Patel. They were modernists but one senses they had a sensitivity that eludes the current nation-state. As Modi completes the ritual of the inauguration, Medha proceeds to the ritual of Jal Satyagraha at Chota Barda Ghat in Barwani. Nitin Gadkari talks of the 22 lakh hectares of land that the dam will irrigate. Medha invokes the 40,000 families living in the submergence area. It is almost as if two different histories are confronting each other asking democracy and the future to judge. This battle between the postcard proclaiming the victory of development and the letter emphasising the failure of justice will haunt India in the years to come. Modi talks of the justice that his regime has offered to Patel, redeeming his role in history. Medha talks of the injustice done to a tribal people, to a way of life, challenging the idea that suffering can be understood through cost-benefit analysis. The magnificence of the dam as front stage hides the backstage dinginess of promises broken, of the temporariness of tin sheds as indifferent acts of rehabilitation. Worse, the promise of rights of livelihood to fishworkers, potters and other landless workers lies unfulfilled. Rehabilitation and completion of the dam become obscene words as one stumbles through the litter of forgotten promises. On one such side is the triumphalism of the nation-state and the imposition of development and on the other is a plea, a prayer for remembrance and justice. The two juxtaposed narratives sum up the contradictions of democracy. It raises a question of what happens when a middle class, majoritarian regime side-lines the dissent of marginal people struggling for livelihood. 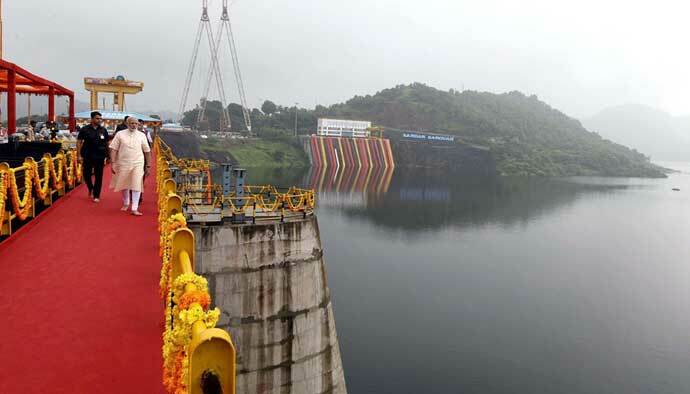 The postcard of Modi inaugurating the Narmada dam will be flashed across the world. The letter Medha and her colleagues have written will be read by a few, the question is which will stand the test of history. Narendra Modi’s ritual performance over the dam is an invocation to discipline, unity. Medha’s message is a plea for an ethics of memory as an ethics of justice. The question before India is stark — which one do we choose. Old fashioned people like me who have seen the Indian record on development are on the side of Medha. But the question is, will the new aspirational consumer driven generation consider our appeal as sense? The years will decide as our struggles continue.